Inspiration comes in many forms and shapes. The best moments of inspiration are those that come when you need it most, and from the most unlikely of places. Today was going to be a great, productive day. It is the second to last day of camp for my girls. The weather is cooperating. The calendar says August, so the weather has turned here in NYC. No rain, not too hot or sticky. I had my day mapped out. Writing, writing, writing and errands. It was going to be a banner day. You know what happened next. Not one but two girls with summer colds staying home from camp. Forget errands. Forget writing. Forget being a productive human being. Instead, making breakfast, tea, cleaning up, etc, etc. When you work out of the house distractions abound. Part of today's plan was to leave the house first thing and not return until the errands had been checked off the list and I had sat down in one of my favorite coffee shops and written for at least two hours. Oh, what a glorious day it was going to be. Now I am stuck in the house constantly being sneezed on. I cleaned up breakfast then decided to weed through the pile of newspapers and magazine sitting around (yes, I still proudly read actual newspapers and magazine). Papers collected, I figured I would run them down to the recycling bin. These are the distractions of home that keep you from being creative. 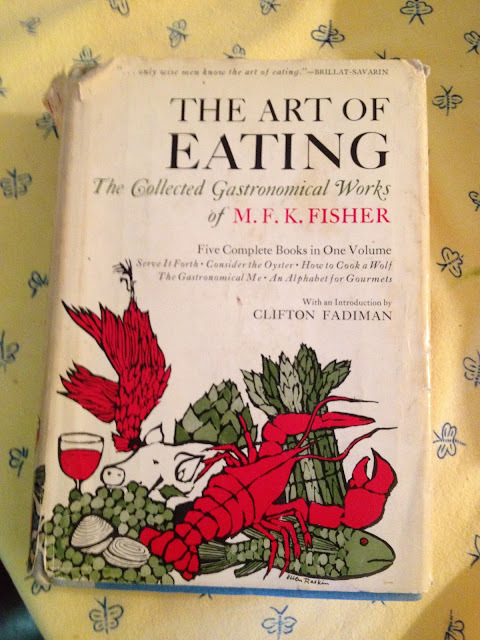 M. F. K Fisher is one America's legendary food writers. This collects five of her seminal works from the first half of the 20th century, including "Serve It Forth." Finding this was a sign. I checked the copyright page. This book was published in 1954. That sealed it. I will not go on a a rant about email, ebooks, etc. But can't you picture Louise and Betty? I can see them in my mind. And look at that signature. One look at how she signed Betty and you can imagine her sitting at your kitchen table having a cup of coffee or tea. And when was the last time you met someone named Betty? I digress. Finding "The Art Of Eating" lifted my spirits. It made my day. I realized there is always time to be creative. I had made myself a promise that I would write more and be more active on this blog. I haven't kept it. I will now. If M.F.K Fisher could find the time to follow her passion, particularly as a woman in the first half of the 20th century, then I have no excuse. And the possibility that someday a person like Betty, in the effort to keep up a friendship or as a thank you, would take the time to pass along something that I wrote should be all the inspiration I need. So a few thank yous and a promise. Thank you to M. F. K. Fisher for leading the way. Thank you to Betty for being a kind and thoughtful friend. Thank you to whomever decided to discard this book and put it into the recycling bin instead of the trash. And thank you to the food and writing Gods that steered me down to the bin at exactly the right time. As for the promise, it is to you and, importantly, to myself. I will not look for excuses. I will find the time to write. I will value creativity and trust in myself enough that it is a worthwhile pursuit. And I will keep "The Art Of Eating" in constant view as a totem and inspiration. No excuses. I have several of her books--and read and re-read them time and again. Will look forward to a discussion on this one with you! Over some fried chicken perhaps? Quit 9 to 5 Academy course is the ultimate knowledge providing the course, you can take up to leave your 9 to 5 jobs and live a life of freedom and fun. The courses that are included in the Mark Ling’s Quit 9 to 5 Academy course is full of tested and proven teachings when utilized the right way these lessons turn out to be the best weapons you need in starting your own business.